The last will and testament of Hardy Lassiter. And I give unto my Daughter Penny or her heirs fifty dollars from the proceeds of my affects. I also give unto my Daughter Sally Artice fifty Dollars out of the proceeds of my effects and I Also give unto my Daughter Rachel One feather bed & furniture the one Known as the bed I occupy my self. And one cow by the name time. And thirty Dollars in Money from the proceeds of my affects. Tarborough Southerner, 24 September 1853. In the 1850 census of Edgecombe County: Hardy Laster, 73, wife Beady, 54, and children Mathew, 26, Silas, 26, Green, 25, Hardy, 21, and Rachel, 20; all described as mulatto. Hardy reported owning $650 of real property. In 1860, Penny Lassiter headed a household in Gardners township, Wilson County, and Silas, Matthew and Green Lassiter headed households in Wilson township, Wilson County. Wills, Edgecombe County Records, North Carolina State Archives. ← Deliver him to Toisnot Depot. I think I’m related to this family. Do you have any more information? Vanilla Beane, you and I match DNA on ancestry. I match you and Mrs Beane? Yes. It would appear that her uncle was my 2nd great grandfather. And I match you both? Which test? I don’t find a match for you, I may have mistyped. I match Mrs. Beane on the ancestry dna. Ah. Okay. 🙂 I’ve got cousins who are Lassiters, but I am not, to my knowledge. Are you a relative to Mrs. Beane? No. My cousins are descended from Hardy Lassiter > Silas Lassiter > Millie Ann Lassiter Knight > Jesse Lassiter > Mildred Lassiter Sherrod. Do you have Angeliam20 in your matches? Your research and articles have been very helpful! You have quite a wealth of information in Wilson, NC. 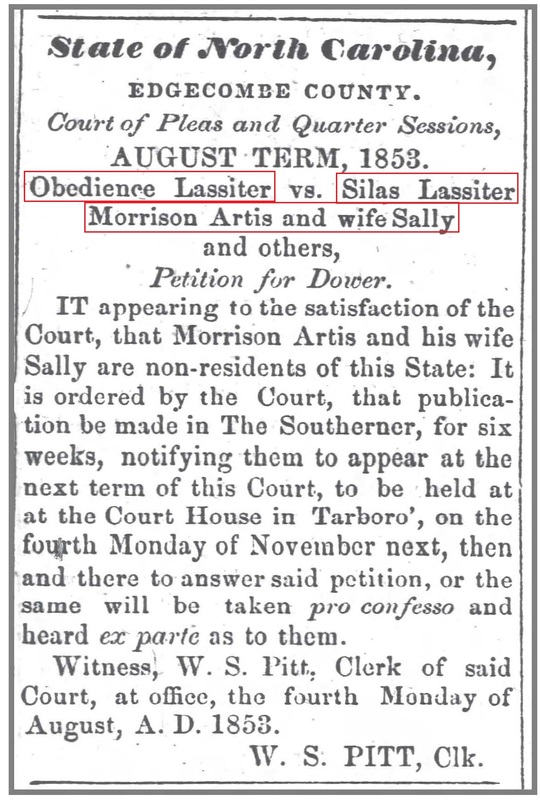 I’ve recently discovered I’m a descendant of the Free people of North Carolina, are there other archives that someone out of state could research? I would love to know more of the family history, see family photos and speak with other Lassiter/Powell descendants. Hi. No, there’s no archive curated for material re free people of color. I maintain another blog, http://www.ncfpc.net, but any Wilson material that’s there is posted here, too. My cousin is an avid Lassiter researcher, and I can connect you with her if you’d like. That would be tremendously appreciated! Thank you so very much!